TOGAF emphasizes the need to tailor its documentation to meet the individual needs of each enterprise architecture project. Every enterprise and every project is unique, so it is impossible to provide a generic enterprise architecture framework that would work for everyone. 1 - How to tailor TOGAF to meet your needs? 2 - How to keep everyone up-to-date with the customized approach? In part of 1 we take a look at how you go about tailoring TOGAF® to meet your needs. 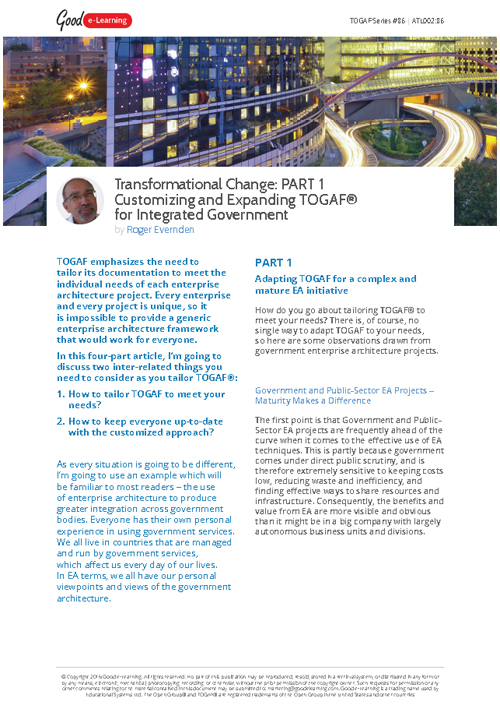 There is, of course, no single way to adapt TOGAF to your needs, so here are some observations drawn from government enterprise architecture projects. If this TOGAF resource interests you, why not view our other TOGAF learning resources? Or view our full library of downloads covering a wide range of subjects and domains!